In the wake of the Kavanaugh fight, many Republicans and conservatives used their basic faculties to detect a strong and distinct strain of intimidation tactics within the Left's manifestations of opposition. We witnessed unhinged disruptions of hearings, violent and sexual threats against Senators, doxxing of elected GOP officials, hoards of agitators charging past police to swarm the Supreme Court, banging on its doors while chanting, and 'activists' hounding elected Republicans out of restaurants. Elements of the Left were acting like an angry, dangerous mob. We also saw mainstream political figures within the Democratic Party winking at the mob, from Hillary Clinton, to Eric Holder, to Mazie Hirono -- to say nothing of the more explicit calls for incitement and harassment from Maxine Waters and Cory Booker. As a survivor of a politically motivated attack, it is tragic to think this is an acceptable state of political discourse in our country. I refuse to stand for this and I will continue to call for an end to it. A healthy, strong democracy is not possible if anyone lives in fear of expressing their views. If this is going to stop, it must start with Democratic leaders, who need to condemn, rather than promote these dangerous calls to action. In America, we win battles at the ballot box, not through mob rule or intimidation. While it’s clear many Democrats refuse to accept the election of President Trump, if they want change, they need to convince people with their ideas and actually win elections, rather than call for violent resistance, harassment, and mob rule. As I see, working in Congress every day, it’s possible to agree without being disagreeable and address political differences in a civil manner. That’s an example leaders need to continue to set. There is a yawning legal and moral gap between First Amendment–protected activity, no matter how angry and boisterous, and a true mob. 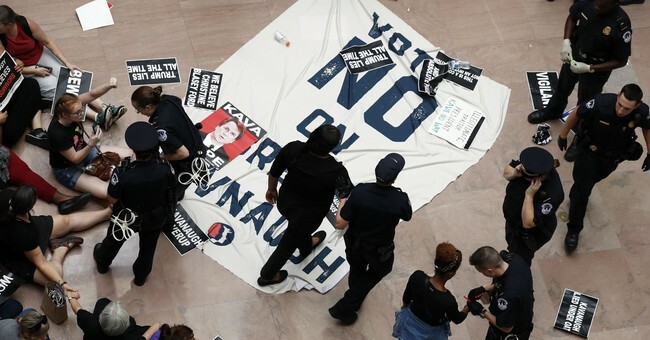 Screaming protesters picketing on a sidewalk are in a fundamentally different position from screaming protesters who invade private property to chase a senator from his meal. Angry demonstrators chanting in front of the Supreme Court are different from people who break police cordons and pound on its doors. Handmaids silently mourning the birth of Gilead are not the same as men and women who disrupt Senate hearings and votes. Legally protected protest is safe. It’s consistent with the best traditions of American dissent. It’s truly what “democracy looks like.” Mob action, by contrast, is dangerous. It creates imminent risk of personal harm. It’s designed to frighten and intimidate. There is no place for the mob in a constitutional republic...It’s time for Democrats — and members of the media — to dial back the rhetoric. It’s time to stop excusing, rationalizing, and minimizing behavior that is dangerous, menacing, and threatening...Dissent, yes. Mobs, no.